Summon a random creature from each discard pile. Raise Dead is a legendary Endurance action card. 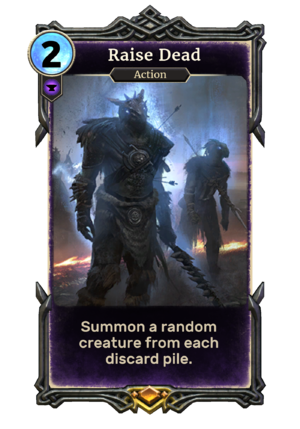 Like other Blood Magic spells created by Blood Magic Lord, this card is based on a vampiric power or item from Dawnguard; in this case, the Raise Dead power. The card applies the Reanimated card effect. This page was last modified on 24 September 2018, at 23:10.